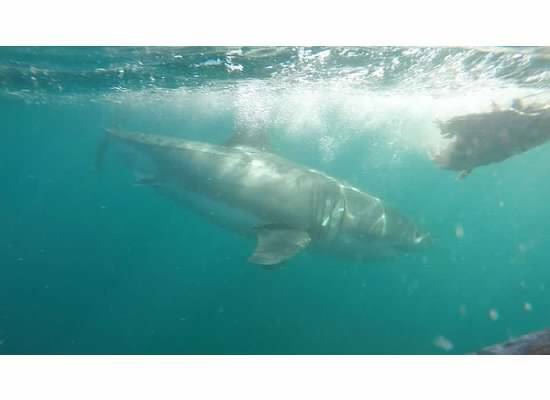 What to experience Cage Diving in South Africa with Sharks? Is it better than Australia and San Diego (Isla Guadalupe)? 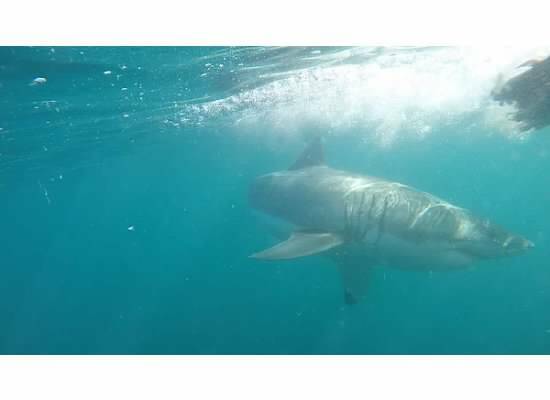 One of the items on my bucket list was swimming with the Great White. From my understanding, there are only three places in the world to see Great Whites: South Africa (Gansbaai), Australia (Port Lincoln), and United States (San Diego). I only found out about San Diego when talking with our guide / instructor. To see sharks in San Diego, it requires a trip out to Isla Guadalupe, which is a 5 to 6 day adventure and very expensive (thousands of dollars). As for Port Lincoln, it is a 2.5 hour to 3 hour boat ride to the cage diving spot. This also assumes that you are in Port Lincoln for departure at 6:30 am. Port Lincoln is located nearly 7 hours (651 km) from Adelaide or 50 minute flight. As for cost, it is going to run you $495 AUD ($365 USD) for the experience. Most people on the boat arrived from Cape Town. The tour operators can organize transport, or you can drive to Gansbaai. It appeared that most people drove to the location. I was picked up around 5:30 am, but it can supposedly be as early as 4 am. In the summer, there might be 2 or even 3 trips for one company in a given day. In the winter (e.g., July), there was only 1 trip on that day. The beauty of diving in South Africa is that it is only 20 MINUTES from the shore and only costs 1,450 RAND ($135 USD). It is about a THIRD of the price of the experience in Australia. Most operators appear to be in the 1,350 to 1,450 RAND range. You might also have some luck looking at Groupon. There are many other groups as well. You also know that you are in a great spot in that the US TV Show SHARK WEEK on the Discovery Channel is filmed in this location. Upon arriving, you are given coffee/tee and some muffins. You sign your life away on indemnity forms and get a safety briefing. My biggest advice is take motion sickness pills and bring arms bands that help with motion sickness. Out of the 20 people on the boat, there were 4 people that got hit hard with motion sickness (i.e., throwing up). There were probably another 2 – 3 that felt something. We were luckily only 20 minutes to the cage diving spot. The cage holds 6 to 7 people. They split the boat into 3 groups. They throw a tuna fish head that is hooked to a rope into the water, chum the water, and place the cage on the side of the boat. We waited about 20 minutes and then all of a sudden saw the Great White. It was huge. The captain immediately asked the first group in wet suits to jump into the water. The shark ended up making 4 or 5 passes before it realizes that it wasn’t going to be able to eat the fish head. (i.e., fish head is pulled away as shark approaches). After another 20 minutes, the second Great White came into view. After a couple of minutes, the captain yells for the first group to get out and the second group to get into the cage. The second group ended up seeing 2 sharks and the last group must have seen 4 or 5 sharks. From my understanding, most of the time the groups would be allowed back into the water for another 20 minutes or so, but there was another tour group from another company that hadn’t seen any sharks. As a result, it was decided to let that group have our spot. They wanted to keep the karma for another day. Most tour groups do see Great Whites (supposedly), but it is unclear if that means that all groups see them in cage or simply from the boat. Overall, it was a great experience. While the water is cold, it actually didn’t feel that cold with the wet suit. I highly recommend it to anyone visiting Cape Town, and as I mentioned above, this is the best place, closest place to major city, and cheapest place to do it in the world!